THE FRIENDSHIP OF SETTLEMENT WORK. The annual meeting of the University Settlement of New York city was held Saturday afternoon. 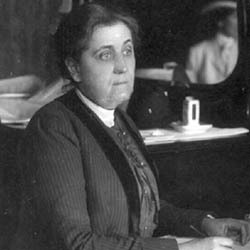 It was marked by a number of stirring addresses, taking up different phases of social service, the principal one being that given by Miss Jane Addams of Hull House, Chicago. 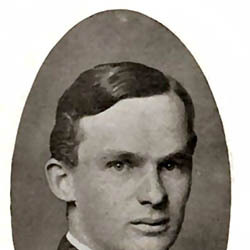 President Nicholas Murray Butler of Columbia University presided, and in his opening remarks contrasted Oxford the "home of lost causes, abandoned beliefs, and discredited heroes," with the modern university, which today "looks forward and strives to be of real usefulness in the building up of the social structure and the advancement of mankind in the way of education and the higher civilization." "The University Settlement work," he said, "is a natural outgrowth of the methods of thought and action inculcated at the modern university. 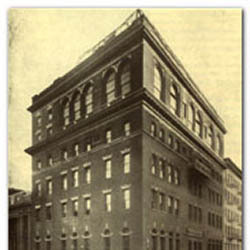 The University Settlement affords the means of developing reciprocal regard among the various classes of society and is of especial importance in a country where there are no artificial lines among the various classes of society, especially important in a country where within a single lifetime one may see many instances of progress from one extreme of society to the other." 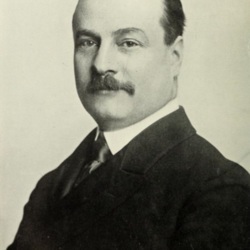 The first speaker was Robert W. de Forest, commissioner of the Tenement-house Department and the president of the Charity Organization Society. "There is a profound desire," he said, "among both men and women to aid in social service. Service is, in fact, the keynote of twentieth century uplifting, and that it is the right keynote we may know from the emphasis which Christ laid upon it. 'Not alms but a friend' is a good motto. The settlement, as I understand it, gives the friend. The Charity Organization Society and the University Settlement should co-operate in their labors. I hope that this policy will be continued and that in every case either society will limit its work to what the other is not doing effectively. 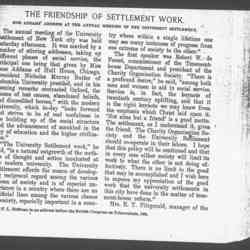 There is no limit to the good that may be accomplished and I wish here to express my appreciation of the good work that the university settlements in this city have done in the matter of tenement-house reform. Mrs. R. Y. [FitzGerald], manager of the [page 2] West Side Branch of the settlement, 38 King street, told of the work under her direction. In the absence of Mrs. James Speyer, president of the Women's Auxiliary, Miss Ella Clark read the auxiliary report. In a short address, Robert Hunter, head-worker, found warrant for the settlement in the proof of its accomplishment. 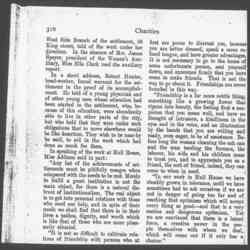 He told of a young physician and of other young men whose education had been started in the settlement, who, because of this education, were abundantly able to live in other parts of the city, but who held that they were under such obligations that to move elsewhere would be like desertion. They wish to be near-by he said, to aid in the work which had done so much for them. "Any list of achievements of settlements must be pitifully meagre when compared with the needs to be met. Merely to build a great institution is not the main object, for there is a natural distrust of institutionalism. 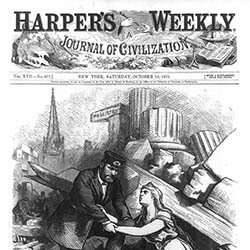 The real object is to get into personal relations with those who need our help, and in spite of their needs we shall find that there is in their lives a pathos, dignity, and worth which is like that of those who are more pleasantly situated. "It is not so difficult to cultivate relations of friendship with persons who at first are prone to distrust you, because you are better dressed, speak a more refined tongue, and have greater advantages. It is not necessary to go to the home of some unfortunate person, seat yourself down, and announce firmly that you have come to make friends. That is not the way to go about it. Friendships are never founded in this way. 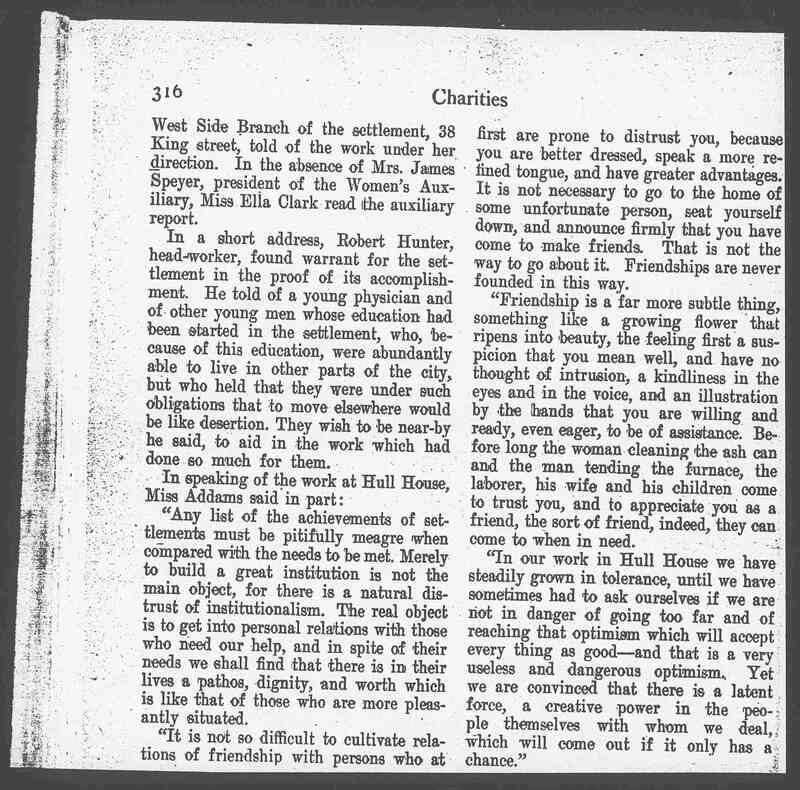 "Friendship is a far more subtle thing, something like a growing flower that ripens into beauty, the feeling first a suspicion that you mean well, and have no thought of intrusion, a kindliness in the eyes and in the voice, and an illustration by the hands that you are willing and ready, even eager, to be of assistance. 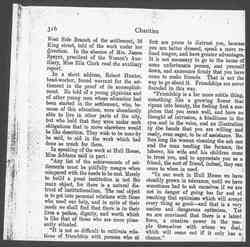 Before long the woman cleaning the ash can and the man tending the furnace, the laborer, his wife and his children come to trust you, and to appreciate you as a friend, the sort of friend, indeed, they can come to when in need. 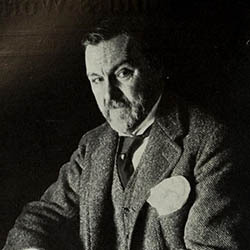 "In our work in Hull House we have steadily grown in tolerance, until we have sometimes had to ask ourselves if we are not in danger of going too far and of reaching that optimism which will accept every thing as good-–and that is a very useless and dangerous optimism. Yet we are convinced that there is a latent force, a creative power in the people themselves with whom we deal, which will come out if it only has a chance." 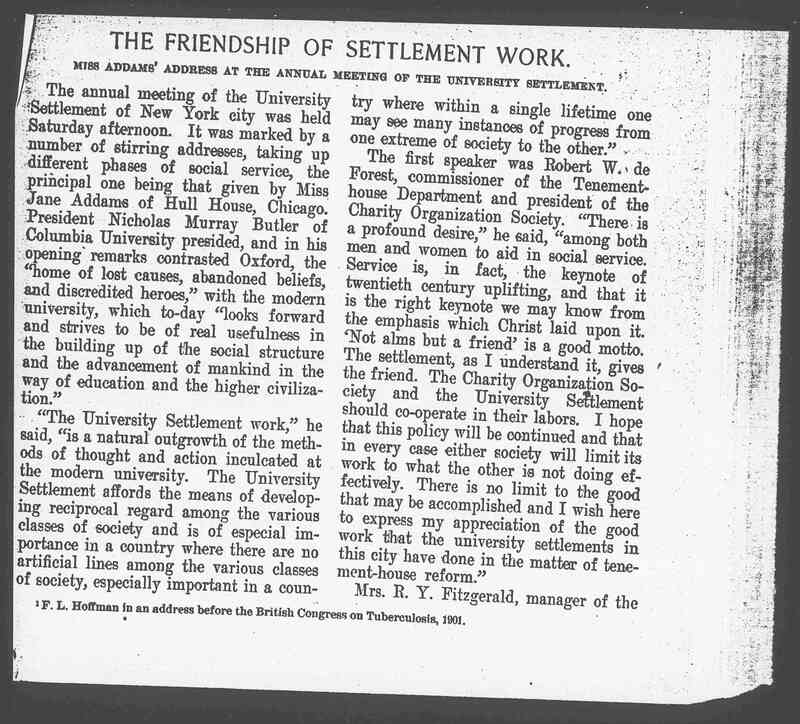 A summary of discussions at the University Settlement by Addams and other speakers that discussed forming relationships as an integral part of settlement work. 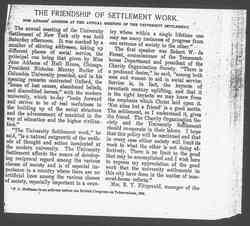 "The Friendship of Settlement Work," Charities 10 (1903 Mar 28): 316. 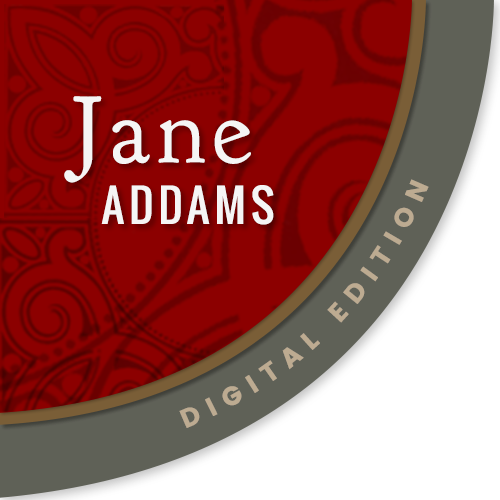 Addams, Jane, “The Friendship of Settlement Work, March 28, 1903,” Jane Addams Digital Edition, accessed April 22, 2019, https://digital.janeaddams.ramapo.edu/items/show/1187.